Sea change: The Royal Navy’s new Type 26 frigates will build on the legacy of its Type 23 forerunners. Royal Navy frigates are designed to fight wars but more normally fulfil peacetime roles that involve policing the seas and helping with the provision of humanitarian relief. A notable example of the frigate’s utility can be found in HMS Argyll, the oldest of the Royal Navy’s Type 23 frigates. Commissioned in 1991, Argyll notched up successes in October 2014 when her crew helped in a four-day clean-up of Bermuda following Hurricane Gonzalo, an act followed swiftly by the seizure of cocaine valued at £10m from a yacht in the Caribbean. Before landing back in Plymouth on 18 December, Argyll and her crew thwarted more drug smugglers during a night-time operation that saw the ship hit full throttle to make up 70 nautical miles in pursuit of a small, highly manoeuvrable boat carrying £36m of cocaine. The Type 23 is assisted in her quest by the multiple systems and personnel embarked upon her to fulfil her remit, including Lynx helicopters and crew, detachments of Royal Marines, and small patrol boats that together help – in these particular instances – to prevent profit from the sale of controlled substances. Furthermore, a new addition to the Royal Navy’s reconnaissance team recently saw Type 23 HMS Richmond deploy a ScanEagle unmanned aircraft to help in the seizure of heroin in the Indian Ocean. One facet that links the achievements of Argyll and Richmond is the demonstration of a frigate’s requirement to work alone or as part of a larger group and the Type 23 replacement, the Type 26, will be no different in that respect. Geoff Searle, Type 26 programme director at BAE Systems explained that while the tasks required of the Type 26 won’t change, her ability to so will be greatly enhanced, a point of concurrence with Rear Admiral Alex Burton, RN – Type 26 Programme. The Type 26s will still maintain the role of specialist anti-submarine warfare (ASW) frigate to provide anti-submarine protection to Carrier Task Groups and other Task Groups and key ASW features will include bow sonar, an ASW Merlin helicopter equipped with its own sonars and torpedoes, and the Thales Sonar 2087 system aft of the ship. Burton added that a ‘tailored-mission’ approach to operations would allow both equipment and crew to be reconfigured to meet rapidly changing operational requirements. “The idea is that a mission load [including containerised cargo including field hospitals, modular accommodation, or disaster-relief stores] can be flown out to wherever the ship is, embarked within 24 hours and then be off and undertaking that task, and that is a capability the 23s just don’t have because they were never designed to do it,” said Searle. In August 2015 BAE Systems announced a major milestone in the Type 26 programme with the award of seven manufacturing contracts for the first three ships, including Babcock for the ship’s air weapons handling system, GE Power Conversion for the electric propulsion motor and drive system, plus testing facility, and Rolls-Royce for the supply of MT30 gas turbine (GT) packages. “The design for the Type 26 GCS is a CODLOG [Combined Diesel Electric or Gas] Propulsion System providing electric motor drive for cruise speed – and ASW stealth – and utilising the gas turbine for sprint,” said Burton. Richard Partridge, chief of naval systems at Rolls-Royce, added that although GT/hybrid arrangements will normally conduct low-speed/transit and ASW operations on the electric drive and high-speed operation on the ‘boost’ gas turbine, the GT can also support operations at ship speeds below normal electric drive/gas turbine threshold speed, when required by the operational scenario. 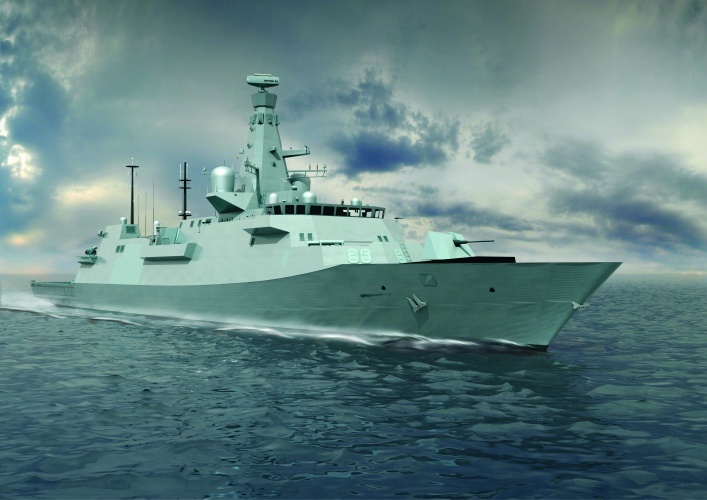 Numerous systems on board the Type 26 have been designed to reduce the acoustic signature of the ship, whose electric drive system – powered by the diesel generating sets from Rolls-Royce Power Systems – provide the ultra-low-noise machinery state required to successfully conduct ASW operations. 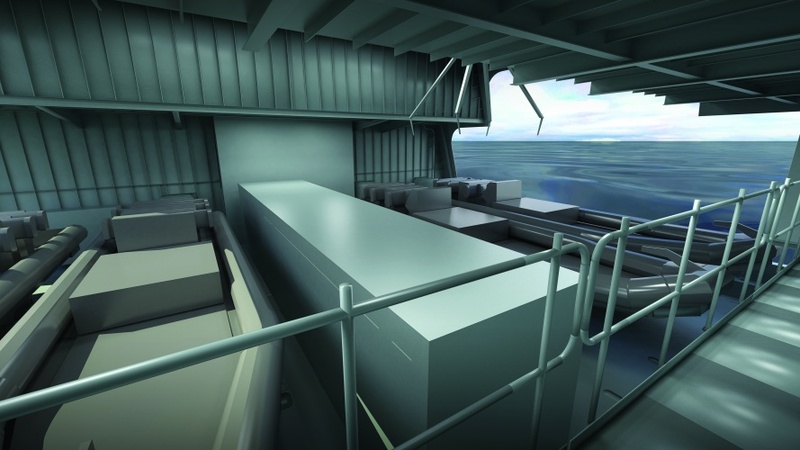 “That said, the MT30 GT is housed in an acoustic enclosure designed to ensure low levels of airborne noise in the machinery space even at high ship speed/GT operation, which contributes to providing an acceptable ship-noise signature across every operating mode, and, of course, provides acceptable levels of crew habitability,” Partridge said. While designed to give the Type 26 its sprinting legs, the MT30 also provides the MoD with value for money as it is designed to maintain its rating throughout the life of the ship, regardless of the weight she might gain following refits. This, said Partridge, has a lot to do with the MT30s evolution from the large-core Trent 800 aero engine. and so on through-life,” he said. It looks very likely that the MoD will order 13 Type 26 Frigates for the Royal Navy and talk has turned to exporting the platform. Again, amazing technology, management, administration, system integration: just asking to be extended to the development, design, manufacture of commercial/civil projects. What steps are being taken to change: or are we still going to buy any of this type of technology and productive facilities we need from abroad. Indeed facilities we could use to create wealth so that we can pay for what we import or spend on non-productive assets? Words like lunatics, asylum and take-over come to the front of my mind. Mike B. Why aren’t you in charge of everything since you know all the answers? The reason that Mike B isn’t in charge is that he would need to become a politician and Mike knows the rules….. If everyone followed these rules the world would be a better place for all !! I think we the rn should get 13 frigates 6 more destroyers 10 corvettes more subs and after hms queen elizabeth and hms prince of wales another aircraft carrier. I am reminded of the comment from Marx (Groucho, not Karl) that ‘I would never belong to a club which thought me suitable for membership!’ Love David G’s rules for purifying the membership of the Westminster Bubble. Actually, my understanding of Parliament and its functioning might surprise CMAE…For my sins in a previous life I was appointed Poet to Mr Speaker (Weatherill) This was after Parliament was first televised and we had much fun: I used to write pieces describing some of the ‘antics’ shown. Bernard W did agree that much of Parliament(s) antics are stupid, wasteful, un-necessary….but pointed out that the alternative is Tanks driving up Whitehall and the Saddam Hussein’s of this world. At least we, the people, have the opportunity to see the bu88ers off every five years or so: I accept that politicians do not, for the most part deliberately make mistakes: but when they do, and they do often, it is possibly/probably because they are insufficiently trained, or educated, or advised for the level of ‘task/decision’ they are required to make? And so few are Engineers and technologists that they are likely to ‘get-it-wrong’ often. The Iver Huitfeldt class are not designed for anti submarine warfare. Furthermore the reported price was subsidized and the yard that built them was closed down! The Type 26 are an excellent flexible design that may look costly on paper but will prove excellent value for many over there service life. Perhaps we should start the southern shipyards again to build more of what we need, eggs in one basket comes to mind. Will we get a vessel that will have enough electrical power on board? Although it is very worthy doing humanitarian work and drugs chasing isn’t it a total misuse of such advanced weapons platforms. Instead of putting all the eggs in a few advanced baskets let’s build a bigger mixed fleet of vessels. Send dozens of cheaper bath tubs to do the humanitarian work and drugs chasing, and have a tighter handful of specialist vessels that can be deployed in the military hotspots. Two times 36 MW from the turbines -what output. It would be nice to see an article by the esteemed on-line magazine ‘The Engineer’ on the propulsion chain including the water jet pumps and how the thrust is directed into the hull. I assume that the T26 has other power sources and how are these integrated into the propulsion and infrastructure. Thanks for keeping us engineers informed. I hadn’t realised how erudite I was a year ago: enough to raise the hackle(s?) of CMAE. Apropos the installed power: am I not correct that the V-bombers could stay airbourne with several of their engines designated for ‘other purposes’ [ie shutting down electronically the communications along their flight paths] So presumably the Navy has ‘redundancy’ in its power trains as well perhaps for related purposes. I am still of the view, like Tim, that some good OR analysis (ie not that done by admirals -of vice or whatever) would suggest that modifying ‘normal’ ships (? do we have, make any such now? )for the occasional humanitarian activity would be better/more efficient than using those described. Swords to ploughshares (or should that be the other way round?). My son is an Engineer and officer in the Royal Navy. He thinks your suggestion is akin to training F1 racing drivers on mopeds and only allowing them to get into their cars on race day. The whole point of deployment is to train personnel to use the complex and maintenance hungry state of the art warships. What better way than chasing drugs runners or helping with humanitarian crisis. Also if the navy personnel are dotted around the globe in normal ships, learning nothing, it would be rather slow to return to the correct ships and respond to a need elsewhere in the world. The above article,says the frigate could embark a Chinook!!!! Not a chance. I recall well that at the start of the six-day war (1967) one Israeli soldier described being at home in London, ordered to attend his ‘transport -an El Al Flight- and being in action 7 hours later! I gather planes go even quicker now! Come on, as we simple textile machinery people found out. It was common practive 40 years ago for all mills and agents to hold vast stocks of spares in strategic locations all over the world: then someone founded/thought about DHL, Federal Express and other courier services we can get almost anything almost anywhere in hours! And do! [Oh, I forgot: one of my best Engineering students at Coventry University was NOT accepted for the Navy: after a selection board. I wrote asking for the opportunity to invite the board to re-consider. They didn’t, but I was invited to attend (as an observer) a Board (what the Army used to call a WASB -War Office Selection Board) which seemed to me to involve groups, taking it in turns to be leader demonstrating their ability to think how to carry imaginary barrels over imaginary objects and obstacles? The winner? the day I attended, was a young lady, who had worked for McDonalds (and that’s burgers, not aircraft) and shouted the loudest. Not sure how that demonstrated any leadership (or even Engineering qualities) but I am sure someone is going to tell me. Thinking backwards for precedent instead of forwards with inspiration? Not Yet?but I live in hopes. “….the complex and maintenance hungry state of the art warships. ” David Hogan’s comment. So, I hope your son and his colleagues are acting as our great profession requires: and simplifying and reducing complexity. Perhaps I could repeat a series of the stories told to me and school mates by our house-master about his war service. We are speaking of 1942-5. He was studying medicine at Uni before call-up: so according to the navy, that meant that he had technical skills. He was put in charge of the increasingly sophisticated ‘detection’ systems being provided. He described a new ‘boffin’ turning up with new electrical ‘boxes’ every few months, and coming on short sea-going trips to fit and demonstrate their capabilities. On one occasion, when the new box was switched on, the entire bus-bars on the “ship” ‘shorted’ and there was an almighty flash, sparks, fire at the equipment. Percy-LLewelen Thompson (my HM’s name) called the fire/damage control parties into action and the boffin simply said “Tendency to spark” as he looked-up with a face, blackened by the explosion. PL-T also said that whilst many of the electrical cabling runs on all ships were of course duplicated on Port and Starboard, if the first was hit, it required the fuses (800 amp then, probably many more now!) to blow to use the other. It was known that several capital ships had been rendered defenceless , because these fuses failed to ‘blow, stopping ALL electrical effort.